After finally progressing to the knockout stages of a World Cup finals, Algeria have consolidated their place in the African elite. For the first time in over two decades, opponents will view the North Africans as favourites, and that is a tag Les Fennecs will have to learn to play with. The man responsible for this summer’s success – coach Vahid Halilhodzic – has refused to prolong his journey, after rejecting a contract extension. His replacement is former Lorient manager Christian Gourcuff. Gourcuff comes to Algiers in full praise of his predecessor. The 59 year-old Breton has stated that he does not feel he has to revolutionize Algerian football because he already has a special group in place. Nevertheless, Gourcuff does bring his own ideas and modus operandi. A trademark characteristic of his teams was a supple 4-4-2 that he so meticulously cultivated at Lorient. It is to be seen if Gourcuff insists with such an attractive system, or if he will adopt a more pragmatic approach for away fixtures. Ethiopia has recently made encouraging progress of their own. Credit for the evolution should be shown to former coach Sewnat Bishaw who constructed a united and experienced group. After qualifying for the Africa Cup of Nations in 2013, the Walya Antelopes won their World Cup qualifying group, advancing to the play-offs. The East African giants then drew Nigeria. Though they put up a good front – scaring the African champions on several occasions – defensive naivety and poor goalkeeping unwound the yellow, red, and green pretenders. In Saladin Said, Ethiopia have a talismanic striker with pace, power, and a delicate scoring touch. He has the ability and experience to lead them through tough matches ahead. Shimelis Bekele will play off his shoulder, animating and stimulating a turbulent attack. The gentle giant in midfield, Asrat Megersa, sits back, languidly sweeping possession from side to side. Addis Hintsa who is dubbed ‘the Ethiopian Xavi’ is another to watch in midfield, as he has the capability of cutting open this stingy Algerian defence with his incisive passing. The Walya Antelopes can also rely on advantageous climactic conditions in Addis Ababa. Travelling to the Ethiopian capital is never easy and the length of the trip engenders fatigue. The Addis Ababa stadium stands are always packed to a hilt and is situated some 2500 metres above sea level, which means Les Fennecs will have trouble keeping pace. Addressing the altitude, Gourcuff said that there was no miracle solution. Team specialists maintain that it takes a fortnight to acclimatize to such conditions. Preparing in a fortnight is impossible due to the brevity of the international break. Algeria will therefore try to conserve possession and not engage the Walyas in a physical end-to-end battle. 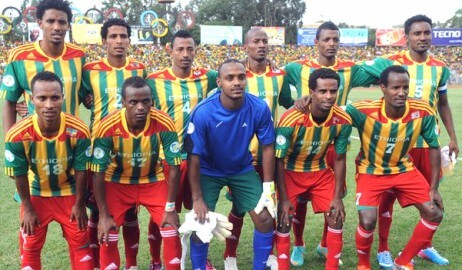 Ethiopia will try to please home support by breaching the Algerian defence with swift and dangerous counter-attacks. Either outfit can hope to take all 3 points on Saturday afternoon, in what promises to shape up as an exhilarating fixture.